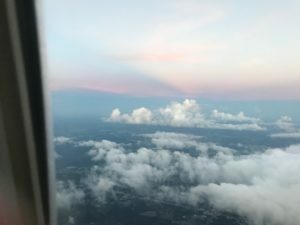 As I sat on the plane, reading glasses resting on my head, Jennifer Dukes Lee’s book in my lap, staring out the small, plastic window, my heart was pounding with emotions of sadness to leave my parents but yet excitement to go home to my husband. I took in every sight as we climbed to the designated altitude for the trip. It was amazing to see the landscape and architecture of the ground below from the sky. Vehicles began looking like ants and street lights like lightning bugs. I could see bodies of water laid out in swimming pools, ponds and lakes. Houses were placed in clumps in what I assume were neighborhoods while athletic-field outlines designated specific sports. And then things got bumpy and cloudy. While we were ascending through the fluffiness, I lost sight of the houses, lakes and football fields. My body was full of anxiety and I had a few minutes of holding tight to my seat. I couldn’t see the ground anymore and something in me felt out of control. Why was that? I was no more in control when I could see the ground than when I couldn’t! It was the pilot who was always in control. Satan does the same thing to us. We are strolling along in life enjoying the view and living our best days with Jesus by our side. Then the devil gets in our way and causes our vision to become cloudy. We lose focus and before we know it we are stuck in turbulence and holding on for dear life. He wants us to think we are going down. But then we remember, Jesus is our pilot. He is leading our life and keeping us on track to the path for which He has laid out for us. We may get off course and into the clouds, but when we ask for His help, He steers us back. Is your vision cloudy? Are you experiencing some turbulence in your life right now? Hold on and focus on your Pilot. He will steer you back on course. And with Jesus leading the way, the destination is out of this world! This entry was posted in devotional, inspirational, motivational, spiritual on October 3, 2018 by Deanna Young.